What you see to your left is a new kind of Creatine called, “Con-Cret,” manufactured by ProMera Sports. It’s considered to be a pure Creatine (unlike Creatine Monohydrate), listed as Creatine HCI on the supplement facts label, and offers a wide array of benefits to anyone wanting to become more serious about their exercise regimen. Personally, I just started using the stuff and even though I haven’t re-committed myself to a consistent workout schedule just yet, I’ve already seen results while working out at the gym, after having taken my dosage. Con-Cret boasts proven superior solubility in its Creatine, based on research at Vanderbilt University, research that was confirmed by a subsequent study at the University of Nebraska. A brief overview of this research can be found on the Con-Cret website. Solubility is important because it determines how well a supplement can be delivered into the body’s bloodstream. Con-Cret also claims that its Creatine has a superior plasma uptake, meaning that your body can immediately use a greater amount of this supplement once it’s introduced into the body, whereas many supplements only have a fraction of their content made available to the body, thus losing much of their implied benefit. 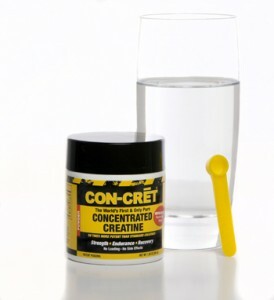 What attracted me to Con-Cret the most is that you do not, I repeat, you do not have to cycle on and off of this creatine as you do with others like Creatine Monohydrate. That was a hassle that I never believed necessary and thankfully, ProMera Sports has proven that with the introduction of Con-Cret. This brand of Creatine supplement also claims no side effects, another qualm I had with the prospect of using other Creatines, and based on my personal use there are no side effects with Con-Cret, just as they claim. The side effects associated with other Creatines are cited as cramping, bloating, water retention and gastrointestinal issues. Once again and thankfully, Con-Cret does not cause any of these side effects to occur. Con-Cret comes in three flavors: blue raspberry, pineapple and raw (unflavored). My local Vitamin Shoppe only had the raw flavor for the powder form. I bought a 36 gram bottle containing 48 servings. The cost was $46 if memory serves me correctly. Most workout supplements’ prices, in my experience, are very close to the number of servings within the container. If taste is a big deal to you, opt for a flavor that actually is a flavor. I believe in this product, however the raw flavor which I bought causes the same facial twitches as getting too much pickle juice on my taste buds at one time. I feel I somewhat have to choke down the mixture due to the potent, raw taste of the unflavored powder. If you click the hyperlinks within this sentence, you can find more precise definitions of uptake and solubility, two of the improved features of this product discussed earlier in the article.